Carmania’s sister ship Caronia was launched July 13th 1904 with piston type engines. Carmania followed seven months later powered by three of the new steam turbine engines. This allowed Cunard to compare each ships performance. Carmania set out on her maiden voyage from Liverpool - New York December 2nd 1905. That crossing showed Cunard the turbine engines could be operated at higher speeds and were more economical to run. Carmania was almost lost to fire while docked at Liverpool in 1910. Luckily, the fire never exceeded her passenger decks and she returned to the Liverpool - New York run after a few months of repairs. 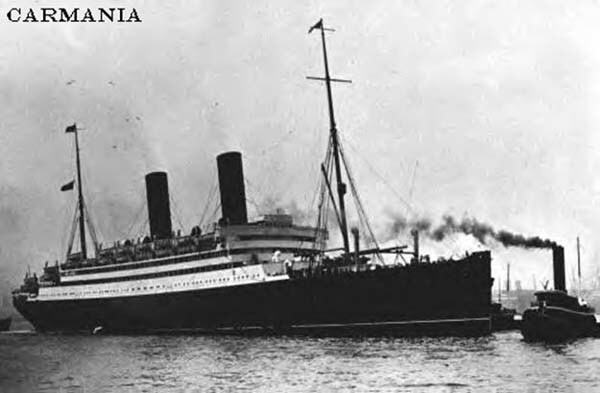 On a return journey to Liverpool in October 1913, Carmania picked up survivors from the fire damaged Dutch emigrant ship Volturno, 30 crew and 130 passengers lost their lives in that incident. While serving for the British Navy as an armed merchant cruiser in 1914, she came across the Hamburg Amerika Line’s Cap Trafalgar near Trinidad. That ship had also been converted to an armed merchant cruiser for the German Navy. In the pursuing hour-long battle, Cap Trafalgar was sunk and Carmania lost seven of her crew after being hit by 79 shells. She had to undergo repairs at Gibralter before serving as a troopship for the remainder of the war. In the months following the German surrender, Carmania was used in the repatriation of Canadian servicemen before being returned to Cunard to have her interiors restored. The completion of that work saw her re-deployed on the Liverpool - New York run in 1920. Three years later, Cunard had Carmania converted to make her more suitable for cruising. Although operating between cruising and the Atlantic run helped keep Carmania in service through some of the hardest times for shipping companies, the continuation of the depression into the 1930s led to her being scrapped at Blyth/England in 1932.